Move mouse left + right to flick your fishy tail and swim (or if you're beached, flop forwards). Move the mouse faster to move faster. To turn in tight circles, move the mouse gently and use WASD. R to reset if you get stuck. You are the fish, being fished. You are trying to survive in a deep ocean, where vision is limited and food is scarce, hardly distinguishable from bat, and often attracting bigger fish. Every time you eat, you'll be risking your life. What dangers lurk unseen, unknown in the darkness, laying in wait? You will be the fish, being fished. You will be trying to survive in a deep ocean, where vision is limited and food is scarce, hardly distinguishable from bait, and often attracting bigger fish. Every time you eat, you'll be risking your life. What dangers lurk undetected, laying in wait? This is intended to be a simple but scary game, putting you in the mindset of a small fish in a big ocean. The biggest part of this will be creating the ambience. To swim, you will flick your tail (mouse) left and right. The faster you flick, the faster you swim. Me and my buddy are gonna have fun making some freaky creatures >:D Camouflage, eerie deep sea noises, and other creepy stuff. I've already got a prototype of the first person fish working, I'll upload it when I get home. Last edited by nesis on Mon May 20, 2013 2:19 pm, edited 1 time in total. I'm very interested on how the movement turns out! I love it when I finally get to move a game character with something other than WASD/arrows/click-to-move. Very interesting controls. Sounds fun! 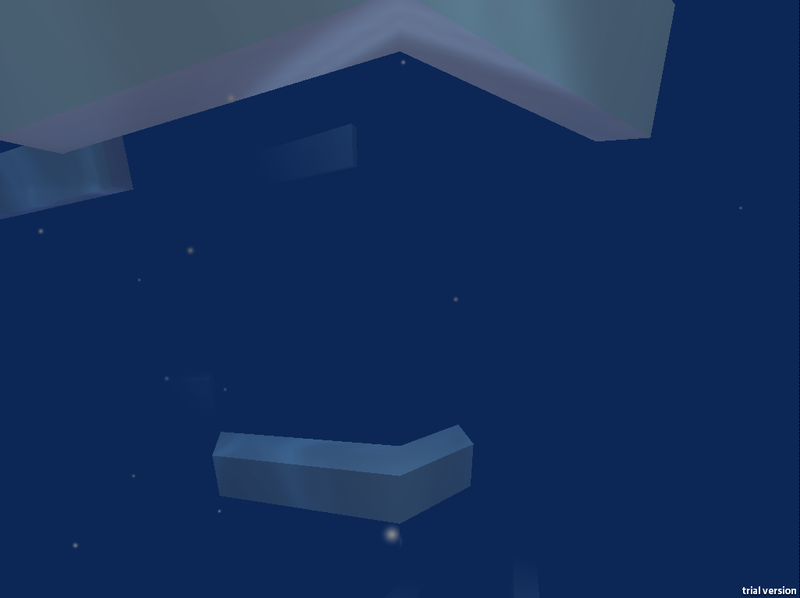 My game takes place in the deep of the ocean too. Getting it too look right for the ambience is a bit tricky. You want it to look dark... but still watery and not space like. Hmm, I'm having trouble uploading that demo the way I usually do. It's down to the latest version of unity creating the web player code differently to 3.4, which I'm used to uploading. I'll poke at it again tonight. Thanks for the encouragement guys I've got some ideas for getting the mood right, but I'd be lying if I said it won't need a lot of careful tweaking. it's really cool, but why does everything bend at the middle of the viewport? Yeah the bendiness is a bit disorienting. What is the intended effect? I really like the caustics. I'm actually carefully aligning the views of two cameras, one per eye on the fish. They line up approximately where a fish's eyes would see, and overlap down the middle of the screen. Due to the cameras not having spherical aberration, the join is a sharp angle rather than being smoothly aligned. My intention is for the experience to be a little disorienting at first, but something you'll get used to, helping you get in mind of a fish I'll try out the fishlens image effect and see how that goes... I'd really like the player to feel challenged to know how far they are from things, so they're kept on their toes and really only navigate by aiming straight at things and darting forward, rather than strafing / circling easily. If you want to do something similar, the caustics were pretty simple to make: two projectors aimed downwards, covering huge areas, rotating constantly at different rates (rates that don't divide evenly into each other work best to avoid short-term pattern repetition), facing slightly different angles, with different-sized versions of the same water caustic texture on them (simple greyscale, with a tint applied). I've uploaded a new version making use of the fisheye imageeffect. I've also tested out the Shuriken particle system a bit more, and I've left it puffing out black dust when you touch the ground instead of something appropriately tinted. I was going to do something quite similar with caustics but given my game takes place at the bottom of the ocean, there really aren't any due to so little light. Very pretty though. Really digging the getting into a fishes brain idea. It probably should be a bit disorienting. That example is so awesome. I'm not used to using my mouse for anything but precision. Even after spending a couple of minutes playing I was still wagging it on the side of the screen I wanted to go =) . The wagging input is really nice. I love the distortion of the view as well. It already feels unique. I'm really looking to what you are going to make.